The FASTURN® is a hollow brass cylinder with a specially designed wire hook that makes turning fabric tubes fun! Magically fill fabric tubes with cord, batting or wire at the same time they are turned. Fabric tubes are easily sewn into quilts, vest, dolls, accessories, crafts, embellishments and fabric weaving. Set includes six cylinders ranging in size from 1/8" to 3/4" in diameter, with three different sized wire hooks. Designed to make miniature projects much easier. Also helpful for button loops, frogs, and small jewelry projects. Set of 3, only 6" long, 1/8", 3/16" and 1/4" in diameter with two wire hooks. Great for making stained glass tubes! For turning larger, longer and bulkier fabric tubes. Use with our " Decorating Projects" and "Easy Quilts" pattern booklets. The tubes come in two size lengths - 12" and 18". Great for binding around quilts and binding around vests. No raw edges to worry about. Just use a decorative machine stitch, and with only one row of stitching, your project is done! 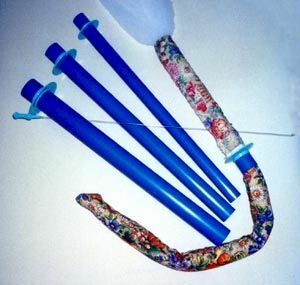 Set of 3 blue tubes, 12" long in 3 diameter sizes: 1", 1.25" and 1.5". Includes 14" wire hook. 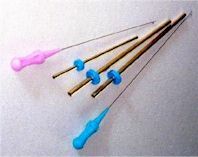 Set of 3 blue tubes, 18" long in 3 diameter sizes: 1", 1.25" and 1.5". Includes 20" wire hook. 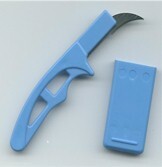 This Seam Ripper can be used for taking out serger stitches by running the curve of the blade under the serger stitches. Use it for straight ripping by turning the blade over and using your machine presser foot as your third hand. Use the tip or curve of the blade to "reverse stitch"! 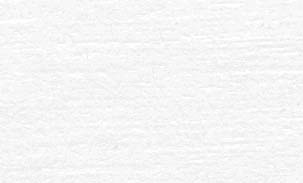 The Bet-A-Guide is a clear, acrylic cutting ruler, you use with a rotary cutter and mat. This amazing new ruler has a raised finger protector. Place your hand behind the raised guide and see how much straighter your cuts are! Clearly visible black measurement lines, in 1/4" increments, plus 45 and 60 degree angle lines. Available in two lengths - 12" and 24"
Now sew fast and easy fabric tubes. FASTUBE FOOT allows you to sew accurate 1/8" to 1 1/2" wide straight of grain OR bias tubes. 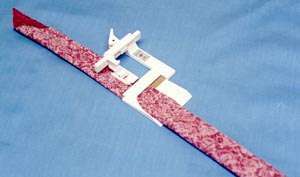 Sews and measures tubes accurately from the fold of fabric to the seam. Five versions to fit most sewing machines. Select the model to fit your machine below. FLS-7 LOW SHANK FOOT - Fits all standard LOW shank machines with feet or snap-on ankles that unscrew. fits most Babylock, Bernina, Brother (except Elna Diva), Kenmore, Pfaff, Singer, White and other low shank machines. For New Home /Janome, Pfaff high shank machines and other high shank machines, use this foot with one of the Adaptors below. Does not fit Singer Quantum series or Brother PC8200. FLS-5V VIKING LOW SHANK - Low shank foot with special Viking screw. Fits the Viking 400 & 500 series, Viking Rose, and Viking 6000 series. 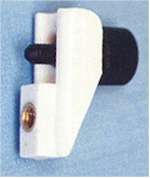 FLS-7P PFAFF LOW SHANK - Low shank foot with special Pfaff screw. Must unscrew sewing machine's snap-on shank. Fits most Pfaff low shank machines, except 1200 Series high shank machines. Pfaff 1200 Series uses FLS-7 Low Shank plus the Hi-Lo Adapter below. 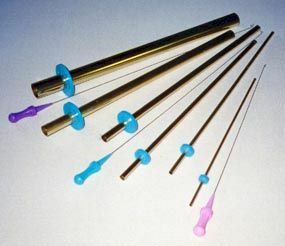 FSN-8 SINGER SLANT - Fits Singer machines with a slant shank: Singer Slant-O-Matic, Touch-N-Sew, and Athena models. Does not fit Singer Quantum series. FSN-8VIK VIKING SLANT - Fits Viking machines with a slant shank, Viking 900 and 1000 series, Viking 150, 1050,1070,1090, Vinking #1 and Viking #1+ machines. FHL-9 Hi-Lo Adapter for standard high shank machine & Pfaff 1200 Series. 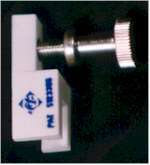 NHA-24 New Home/Janome Adapter for 8000 and 9000 models ONLY and Elna 9006.